I hope it went well. She mentioned she was going to see you. I like your explanation written here. It makes a lot of sense. How did I find the online mom community? For 2 years I was the only mom I knew, and I felt alone, and my kid had health issues. I wanted info and I wanted to not be alone. I am living 8 hours away from my family and all the friends I grew up with, so I started blogging as a way to keep in touch everyone back home. I was also the first of my friends to get married and have kids. It was only this past January that I started to branch out and talk to people I didn't know in real life. I am so glad I did, cause I have met Lovely women like you all over the counrty that I can truly relate to. I absolutely love connecting with other mommies that share my views and interests. I am a very social person and this has been a great outlet. It also makes me less homesick. I have learned so much from you other mommies too. Wonderful, Erin. Whenever I'm with my grandmother I realize why they have been able to be such content wives, mothers, housewives, part-time workers to pay for kids' education, cooks, laundry women etc....for year and years. They were trained how to be good at it, and they were really, really good at it. It's an art. You are totally right. We want to not be alone, and we want to be confident. Please don't edit out any paragraphs in the morning. Amen, sista'!! You really hit the nail on the head with this one. We really do have such a need for community and "empowerment". So much so that we have found ways to accomplish it even in our isolation. When I was pregnant I began to get glimpses into the online mommy community. Google was and still is one of my dearest friends. Like you, Google helped me learn to cloth diaper, breastfeed, etc. 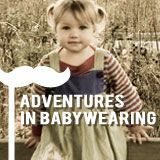 I didn't know much about the blogging world until Levi was around 6 months old. The minute I found out about blogs, I signed up for one. So many of my friends and family had moved that I thought it would be a great way to keep them informed of our lives. Blogging has become so much more. By being a part of the blogging community, I have learned so much about being a mother and a woman. It is truly a blessing. Wow, that's great you were interviewed on the radio! I like what you had to say. I agree, it's better and more relevant to hear about other moms' experiences with motherhood directly from them rather than from a reporter. And building rapport or friendships with those moms is amazing. Oh my gosh, where would I be without this crazy (and I do mean, CRAZY) mom blogging-googling searching internet thing? I would love to know how many hours I have spent looking up things like "my baby makes grunt noises when sleeping, is that normal." Good post. And so cool that you could share your input on the radio! It makes me smile a little now at how antiquated some of this essay is, even though I wrote it only 5 years ago! Anyway, like you I got on in search of information, and stayed for the community. But in many ways, I do think it was damaging to have so much of my identity and social life wrapped up online. I was bored, and lonely, and looking for an outlet, but I realized that even the strongest online community can't replace the friend you get together with in real life to keep one another company while you parent your kids. Maybe that's the Internet's limit--you can't really have a meaningful online discussion while changing a diaper or doing the dishes...the stuff of a mom's life. So you either have to put all that real-life stuff aside while you get online and/or squeeze your online time into a few quiet moments of the day. Whereas with my IRL friends, I find that I can pretty seamlessly blend parenting and conversation--with a few interruptions, of course. I totally love this line: "And we don't want to hear about them from Good Morning America. We want to hear about them from each other." Hear! Hear! I agree about that. I don't know what moms did/do without the Internet. I love this space, this place...to meet moms, to make friends, to get info, even to win prizes. I love it all. Well said, Erin. I'm especially loving your entries lately. You're very inspiring.